One day. One lens. One great city. That’s a combination to live by — especially when it gives me the opportunity to resurrect one of my photographic roots: street photography, which I’ve always taken to mean as nothing fancier than walking around with a camera and shooting whatever comes my way. My wife and I need a regular New York fix — museums, meat, martinis and, for me, a Manhattan walkabout. I indulged in the latter (after too much of the former) on a Sunday afternoon. Starting at the southern tip of Manhattan, I strolled Battery Park amid a glut of other tourists, circumnavigated the Staten Island Ferry Terminal, walked up to Wall Street to Trinity Church and then caught an uptown train to Midtown for a B&H break, and finally onto Central Park. I loved the freedom of almost no gear and the demands it placed on me to move and adjust. Instead of bringing the picture to me, as a big fat bag of lenses can do, I had to go the picture. I also had speed. For those of you who jump to the gallery, look at the wedding shot. It was a turn and shoot, over in a 25oth moment. One lens, ready to go, makes that possible. These days, as I chase assignments, try to learn technical skills others learned long ago, and spend hours at the computer doing high-rezzes and cataloging, it’s easy to forget the joy simple photography brings — the frame being filled, the captured moment, the image preserved. These were the thrills that drew me to photography originally. A photo walkabout on a sunny New York Sunday does wonders to refresh the eye, lighten the head and remind me, again and again, of the wonders of photography. Click here the images (and a few choice New York quotes). I hope you enjoy seeing them as much as I did making them. 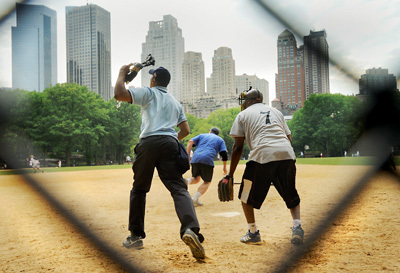 This entry was posted in Personal, Travel and tagged B&H, Central Park, Manhattan, New York, softball, Walkabout.